Follow the steps below and learn how to refill ink cartridges PG-510 / PG-510XL Canon printers. Canon cartridge PG-510 ink capacity of 220 — A4 pages sizes normal —, pigmented ink, they are one of the best cartridges in the market for quality documents. On the American continent would cartridges Canon PG-210 ink, so use the same procedure to fill. 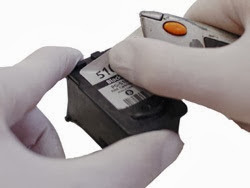 We need a syringe, pigmented black ink (if you can not get this OK), an area where you can put a cartridge and there is no problem spilling some ink, a little patience and napkins to wipe up any spills. It is recommended to remove the label and put in a place where not damage the glue in this way can paste it back into the printer again and prevent more air than necessary for the holes in the cartridge. You must fill the syringe with at least 8 ml of ink if the cartridge is standard, and 15ml ink cartridge if the version is extra large (XL). Deliver ink through the hole will be right in the center, after removing the label will require a bit of pressure to the syringe from the cartridge, in the same way to supply the ink, but we must do it until the vote ink cartridge bottom, means by the printhead. 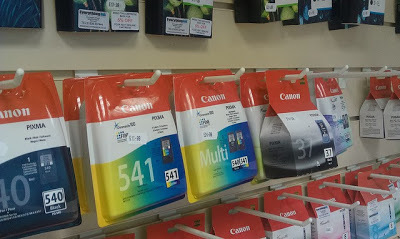 Put the cartridge label again and the cartridge into the printer, then it is recommended to print a test page, if the quality is not the best perform a head cleaning thoroughly, this will help the ink drops to head printing. In case of any question or suggestion, just write a comment in this publication, we will gladly help you.